To not have any cares is to be "se-cure", without cares. So on early Roman coins "SECVRITAS" does not mean security in the modern sense (covered with locks and chains and overseen by guns, which may be a means of achieving security) but "the public does not have a care in the world (thanks to me)". 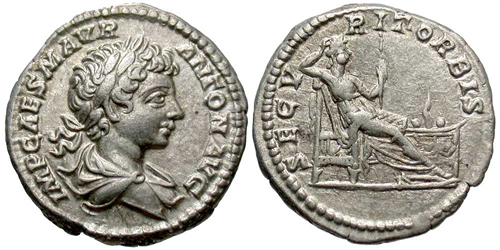 The lady Securitas appears on coins of several early emperors and can be distinguished from all the other Roman imperial figures by having a languid air (since she has no problems) and by sitting back on a throne with elbow resting on the back, or sometimes resting her head on her arm, or if standing, her arm on a column. A denarius of Caracalla, Roman emperor (198-217), originally under his father (Septimius Severus, 193-211 AD). A languid, care-free, Securitas seated leaning back, right. She holds a vertical scepter and behind and to the right there is a lighted and garlanded altar. Silver. 18 mm. 3.61 grams. BMC V (SS and Caracalla) 118. Securtias seated left holding scepter and supporting her head with left hand. Before her, a lighted altar. Struck April 11-December 217 at Rome. "Vota Publica" does not mention ten years. These were vows taken at the beginning of his reign for the security of the state and the emperor. The explicit date is "TRP" for his first year. According to Gnecchi (p. 60), "Securitas almost equals Pax." SECVRITAS types were first issued under Nero as SECVRITAS AVGVSTI and refer to the security the emperor provides, the Roman people (SECVRITAS P ROMANI), or the whole world (SECVRIT ORBIS, as above). The types are various, but through the end of the third century most designs are similar to the one above or the next one. An aurelianus, sometimes called an antoninianus. SECVRITAS AVG, B in exergue. Securitas standing front, head left, with legs casually crossed, right hand up to the top of her head, and left elbow leaning on column. There is no tension in this pose. RIC V.II 644, mint of Lugdunum, page 298. Constans, one son of Constantine and Augustus, 337-350. 15 mm. Struck 337 - before April 340 at Rome. On this example the mintmark with "R<palm branch>S" is too weak to read. SECVRITAS REIP (Security of the Republic = state), Security standing front, head right, holding a long vertical scepter in right and leaning casually on a column. RIC Rome 34. This type was struck only at the Rome mint. It is listed as "rare" in RIC, but it is really fairly common. However, it is actually rare in full-flan, well-struck, high-grade condition. The transition from "care-free" to "secure". 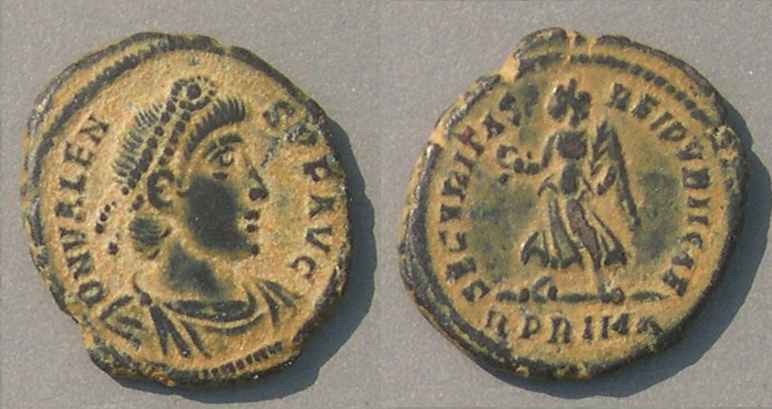 The type of Constans above, struck after the death of Constantine, maintains the "care-free" representation. Gnecchi notes, "In the time of Constantine Securitas was again confounded with Pax, but always after a victory, and we then find the emperor in the act of erecting or crowning a trophy." Unfortunately for collectors, the varieties under Constantine are on very rare and very expensive gold coins and medallions. The first coin on this page is a denarius of Caracalla which illustrates security in its care free aspect. However, even then security was also associated with military success. Caracalla, struck 196-197 as Caesar under Septimius Severus at Laodicea ad Mare. Minerva standing left resting right hand on shield and holding reversed spear in left. After victory there is no need to have spears upright and ready to go. The "perpetual security" follows military success which brings peace and security. 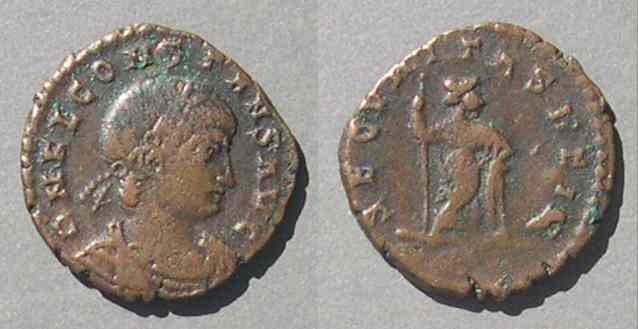 The victory at the time was that of Septimius Severus over Pescennius Niger in the East where this coin was minted. Sear II 6678 variety. BMC 460. This type was struck at all mints. This example is RIC Constantinople "November 3, 361 to June 26, 363." By this time much of the empire was Christian and Julian's attempt to lead the empire back to the old gods was futile. In Antioch, he and this type were ridiculed. How the "bull" type was intended and interpreted has been the subject of many articles, without consensus, and I will not advocate a solution here. Is it an assertion that the old god's, including Jupiter, to whom sacrifices of bull's were appropriate, would provide the security the republic desired? Is it the "Apis bull" of Egyptian religion? The Mithraic bull? Jovian, the immediate successor of Julian, used SECVRITAS types on gold but not on copper. However, it became extremely common on copper under the next emperor, Valentinian I, and his co-ruler Valens. It seems the interpretation of Securitas on Roman coins changed toward the modern interpretation. SECVRITAS REIPVBLICAE (Security of the Republic = state), around winged Victory advancing left and holding wreath and palm (symbols of victory). Copper. 20-19 mm. 4.70 grams. RIC IX Rome 17b, struck 364-375. Mintmark: R PRIMA (Rome, first officina = first mint workshop). This type is one of the most common Roman types of all. Examples from the Siscia mint are readily available and inexpensive in nice grade. Siscia examples have a mintmark including "SIS". At this time, more than a century and a half after the first Caracalla piece above, Security has changed from a general reference to care-free life to recognition that care-free life depends upon victories of the military. Ironically, the army of Valens was destroyed and Valens himself was killed by the Visigoths at the famous "Battle of Adrianople" in 378. SECVRITAS REIPVBLICAE was no more. Roman Imperial Coinage, various volumes. Gnecchi, F. The Coins Types of Imperial Rome, 1908. 75 pages with no photos or line drawings (only page 60 is on SECVRITAS), reprinted by Ares Publishers in a small hardback which also includes 16 pages of tables on which emperors and family members had portrait types in which denominations, by George Elmer. Kent, J. P. C. "An Introduction to the Coinage of Julian the Apostate (AD 360-3)," Numismatic Chronicle 1959, pages 109-117 and plates X-XI. Melville-Jones, John. A Dictionary of Ancient Roman Coins. (1990). Hardback. 329 pages. Seaby Publications. Vanderspoel, John. "Julian and the Mithraic Bull," Ancient History Bulletin 12.4a (1998) pages 113-119.